VADS Berhad (VADS), Malaysia’s leading Integrated Managed ICT/BPO Service Provider and INTI International College Kuala Lumpur (INTI) recently signed a Memorandum of Understanding (MoU) to leverage on each other’s expertise to produce highly knowledgeable and skilled employees. Datin Mohana Mohariff and Rohit Sharma at the signing ceremony. The MoU was signed by Datin Mohana Mohariff, Vice President of BPO Services, VADS and Rohit Sharma, Chief Operating Officer of INTI. The MoU formalises a strategic partnership between VADS and INTI to extend formal education opportunities to VADS’ non-executives and customer service professionals. With the MoU in place, VADS’ staff will be able to enjoy a special rebate on tuition fees for selected programmes offered by INTI. The rebate can also be extended to their immediate family members. In addition, they will be able to take part in any of the training programmes conducted by INTI for free and have the opportunity to use the facilities at INTI campus Kuala Lumpur. “VADS is an organisation that runs on three key pillars; People, Process and Technology. As the largest BPO provider in the country, we have over 5,000 customer service professionals across two countries. We believe in developing the talent we have and this is reinforced through our internal programmes which are designed to enhance the capabilities of our employees. This collaboration with INTI opens up the opportunities for our staff to extend their formal education, which is a natural career progression towards our belief of developing our talents,” said Ahmad Azhar Yahya, Chief Executive Officer of VADS. 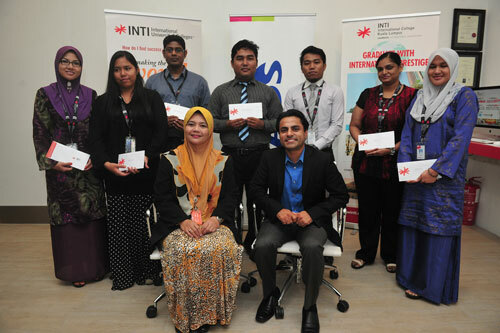 The first batch of employees from VADS enrolling into the VADS-INTI Continuing Education Programme (standing) with Datin Mohana Mohariff and Rohit Sharma. In addition to the above, as part of the partnership, VADS will act as one of INTI’s industry advisors and will contribute ideas, expertise and industry insights towards the enhancement of the curriculum taught at INTI to better suit industry needs, hence preparing students with relevant industry knowledge and skills. INTI students will also stand to benefit from this partnership as they will have the opportunity to perform their internship, engage in real life projects as well as enjoy priority employment opportunities with VADS. This partnership transcends building high quality workforce within the VADS community. VADS-INTI coming together creates an engine for promoting upward mobility and upskilling opportunities for the people of the nation. With VADS and INTI partnering to produce employees and students that can overcome the challenges and recognise opportunities of the new era, it is a significant contribution supporting Malaysia’s vision of becoming a developed country by 2020.